ThermaVein™ was launched in the UK at the end of 2012. It offers a clinically proven, instant, safe and effective treatment of red veins, often referred to as thread veins or spider veins, and medically referred to as “telangiectasia”, as well as other vascular blemishes, using a process of thermo-coagulation which seals the vein walls, causing them to instantly and permanently disappear. 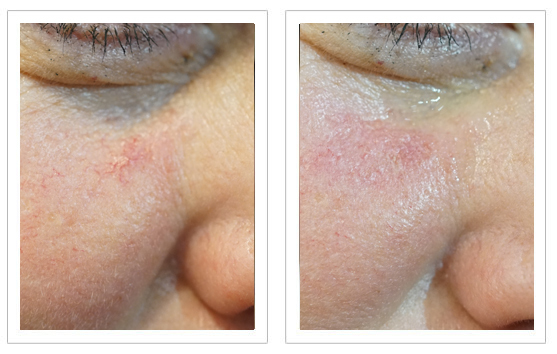 ThermaVein compliments the treatment of rosacea by treating the thread veins associated with this condition, and is best combined with micro-scelerotherapy for treating legs. Thread veins are often considered to be cosmetically unsightly, depending on their location, and many people seek to have them removed, but they are too fine to be treated in the same way as larger veins so thermo-cogulation offers a simple solution. Equipped with a polarisation light system the practitioner introduces a fine needle over the vein and in most cases the vein disappears instantaneously. Unlike IPL and Lasers, ThermaVein® cannot cause loss of pigmentation, is suitable for all skin types, and can be used on men and women. The 4Mhz current is used worldwide and is registered for the treatment of telangiectasia with the American FDA. The big difference between ThermaVein and other treatments is the current. The low current means that it does not coagulate the blood making it safe, effective and instant say the makers. The current travels for approximately 3mm, (a similar size to a grain of sand or the head of a pin), causing the vein to close. The needle is housed and held in place by the ThermaVein pen, which has a very simple push button load system, and is a handheld device operated by a trained practitioner. Once the vein is closed off, blood can no longer flow through it, which means that it cannot be seen underneath the surface of the skin. Results are instantaneous and you will usually be able to see a difference in the appearance of the thread veins within 15 minutes following treatment. European CE Marked since August 2012. Full Medical CE ECC93/42. U.S. FDA (Food & Drug Administration) registered. Trained medical professionals and other practitioners, such as beauty therapists or aestheticians. Thermavein is used to treat thread veins, spider veins, spider naevi and vascular blemishes on the face, neck and hands. Depending on the experience and training of the practitioner it can also be used to treat skin tags and other benign skin lesions. The treatment is typically permanent and will usually remove all visible signs of the underlying condition. In some cases, the veins can recur, but a top-up treatment will usually resolve the issue. If you are concerned that your veins will reappear, many practitioners will offer a periodic review to see if further treatment is needed, often at least an annual appointment. People have described the sensation of the treatment as like a “pinch”, which is easily tolerable. Because the treatment is precisely targeted, it does not generally affect any of the surrounding tissue or the upper layers of skin, which means that you do not need to take any precautions following treatment other than keeping the skin clean and dry. Following treatment, skin will be red and feel warm. Some people may experience very light marks, similar to cat scratches, in the treated area, as well as redness. The redness and cat scratches will settle down in a few hours, or a day or two, following treatment; these are referred to as micro-scabs and should fade, with the skin becoming blemish-free after a short while, depending on the extent of the treated area. The treated vessels will gradually fade and be taken away by the body. 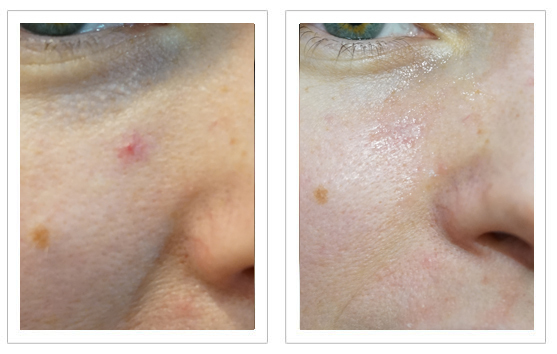 Further treatments on the face can be carried out after 28 days. Reported and known risks associated with the treatment can include bruising or scarring, and no guarantee can be made that this will not happen. ThermaVein thermo-coagulation has a very good success rate and usually succeeds in its purpose, as with all cosmetic procedures it cannot be guaranteed. Treatment typically takes less than 15 minutes per area being treated. People often need only one treatment, although some will require one or two top-up treatments. Larger areas, such as legs may require three treatments or more. The costs of Thermavein treatment will depend on the number of areas being treated, their size and the practitioner, but prices range from £150 - £200 per treatment. Treating warts on the hand with Thermavein. 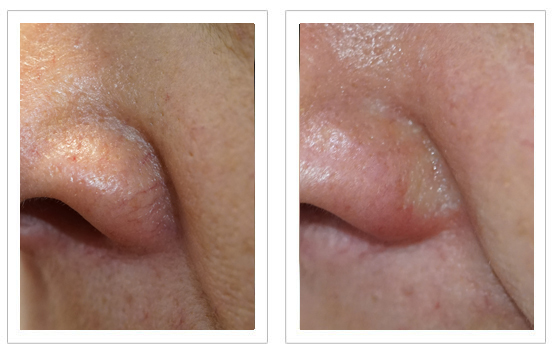 The images below were taken with a specialised camera to get a close-up view of the thread veins before and their resolution after treatment. Treating thread veins on the nose. Treating thread veins on the leg. Images provided courtesy of Thermavein. 2004 study into the effectiveness of thermocoagulation on telangiectasia on the leg using a similar device (Veinwave). 50 patients were tested and the results were positive. Click for ALL ThermaVein™ clinics in the UK & Ireland registered and verified by Consulting Room. 4 out of 5 based on 3 customer reviews.